Oh wow. The first month of the New Year is already heading to a close. How times really does fly. So much has happened with you wonderful people and I know so much more is to come. As a writer myself, I have been kept on my toes with trying to keep up with all the latest news and events, so it has finally come time for me to take a bit of a mini-break. More info about my short hiatus at the end of this post, and just to give you all a hint, I will share this photo making the rounds on Facebook. I hope I don’t get into any trouble for posting this here. (Smile) Anyway, I trust everyone is doing fantastic and are able to take the time away necessary to refresh their creative minds. Our writing is very important, for sure, and our work seems to never be done, but to be able to do what we do successfully, we should remember to take care of ourselves in the process. As it is often suggested, a healthy body is beneficial to a healthy mind. That said, I will bring this intro to a close and get right on into the news. Happy first month of the new year everyone! This year has started out as a blast! 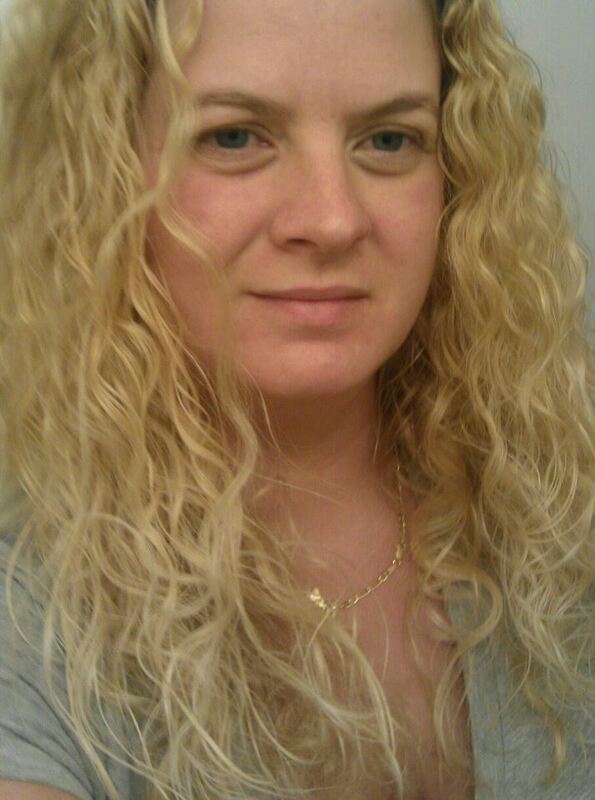 British Humorist/ Romance Author Louise Wise – http://louisewise.com – for her guest post and book release information. Authors Neal James www.nealjames.webs.com & Eris Kelli www.eriskelliauthor.com for sharing information about their new releases. Big congrats to Charity Parkerson http://www.charityparkerson.com/ & Melissa Craig http://melissacraigauthor.wordpress.com/ both finalists in the Australian Romance Readers Awards, for making their respected local news and other upcoming media events in regards to their nominations. Charity had this one to recently share. Best wishes to both of these fantastic authors and wonderful friends on their continued success. Not sure how to say it other than how extremely thankful I am to see my free little story “The Crush” is holding its own since its release in electronic form on Smashwords. The downloads are going really great. There are only a few reviews posted, but every one is 5-star! This is the kind of response that we Indie Authors truly love and appreciate. I am also surprised to see that some readers are still reviewing the story where it originated here on my blog. I love that too and I thank you, dear readers, very much for your continued support. In closing, for business and personal reasons I am keeping this last week of the month fairly light. With my favorite book, ”Secrets & Lies” , just recently updated with a few new edits that I won in a contest, I am working on uploads, promotions, and other submissions. I also have a couple of new short stories I have written to review and hopefully release in the coming weeks. Despite my workload, I will find the time to add important news throughout the week. As we head into the month of February, I foresee a lot of amazing things happening in the Indie Author world and I plan to be right here to share it with you. As always – big hugs, much love, and great success to you all. ~ Tracy J. Notice: As I continue to learn and work through the processes of fine-tuning my blog, I appreciate the kindness of everyone who has taken the time to visit my page, follow, share, tweet, comment, or just say ‘hello.’ It is my absolute honor to meet you and I promise to do my best to show how thankful I am with keeping my word in continued support of my fellow indie authors and more. – Thank you. So…. What a week this has been. 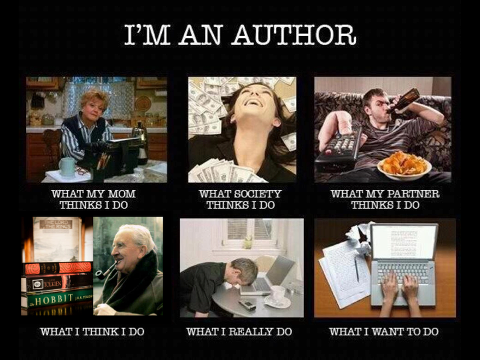 The world of Indie Authors and others in the entertainment business are growing every day. Statistically, or by the numbers, I don’t have a clue. Everything I learn comes from social media contacts and you. My self-appointed job, which I truly love by the way, is to gather this information, wrap it up in an entertaining/professional form, post it and share it with everyone. So far, so good, and if anyone has, knows , or finds someone who needs a place to showcase their work, please send them my way. Always happy to connect. (Please see Promotions & Support here.) That said, let us move on to the news. This has been a great week, my friends. Next week will be too. To ePub Agent Saritza Hernandez and her online paper for sharing some of the best news, and for the continued support she has given to my important tweets and blog posts. Very much appreciated, I assure you. :o) (Some on-site material not suitable for young audiences). Thanks to Author/Publisher Tamika Newhouse, a young woman with a passionate dream and a bright business future ahead, for sharing her wonderful story and for being a force of action, promise, and ingenuity in the Black American community. My words are not enough to express my gratitude. Love to U.S. 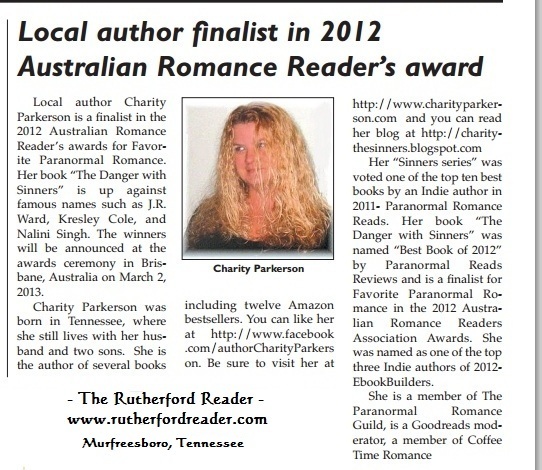 Author Charity Parkerson, Nominee for the “Australian Romance Reader’s Award,” for working with me on writing an actual newsworthy article in support of her nomination. It has been a good while since I have been able to exercise a bit more of my journalism chops, and it was an honor to experience that side of myself in regards to her outstanding news. On a personal note, I am always so proud to know you as a colleague and friend, and win or not, you are still an inspiration to all of us. 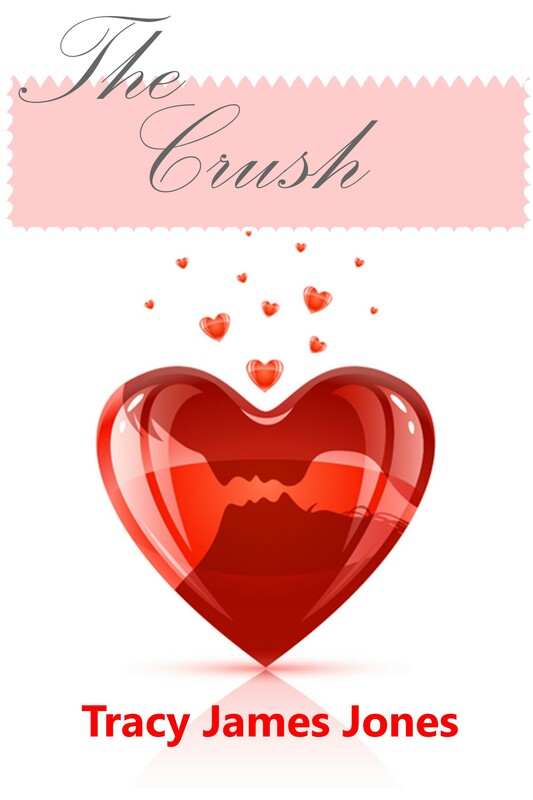 To Charity Parkerson again for inspiring me to released my blog favorite, a short-short-very short romantic story, “The Crush” in ebook form. Though this work has been featured on my blog for over a year, (September 2011 – since May 2012 on wattpad.com), it has taken on a life of its own and is now available on Smashwords.com for free, just as it was always meant to be. And finally, a super big ‘Shout Out” and thanks to the authors who came forward to share their book releases and interviews, and everyone who took the time to stop by to review and comment. You are all truly amazing to me. There were a couple of comments left in my spam box that were meant for the article post on Charity. I suppose they were put in the spam box for a reason, and I didn’t approve them because their pages were not entertainment related. Not sure if they were computer generated or what, but one comment seemed fair to share. In other news, I was recently invited by Paranormal Thriller Author & Investigator Micheal Rivers to be a featured guest on his paranormal experiences blog. I had never really had a conversation with anyone outside of a few people that I grew up with in concern to those types of experiences. To be honest, I had more stories than shared out of respect for available space. I’m a bit early with my information regarding the guest post but it was set to run today, 01/20/2013. For now I will simply add the link to his page. http://michealrivers.com/ Thank you again, Micheal, for the wonderful opportunity! In closing, as always, thank you all again so much for doing what you do and I wish everyone the very best . Big hugs & much love – Tracy J. Notice: As I continue to learn and work through the processes of fine-tuning my blog, I appreciate the kindness of everyone who has taken the time to visit my page, follow, share, tweet, comment, or just say ‘hello.’ It is my absolute honor to meet you and I promise to do my best to show how thankful I am by keeping my word to support, showcase, and anything else I can do for my fellow indie authors. – Thank you. 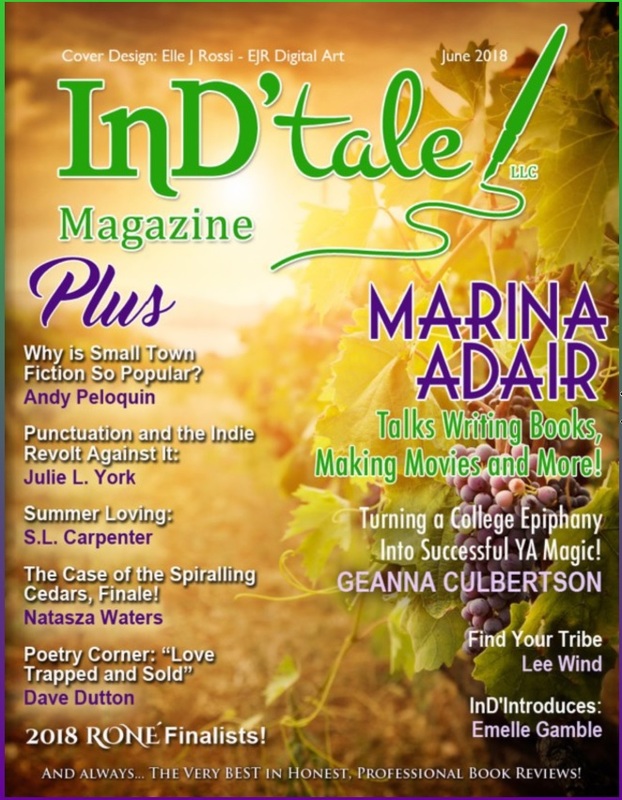 I am so proud, thankful, and down-right thrilled of the International Associations of Indie Authors (meaning my personal associations) who have chosen my blog to share their wonderful news and accomplishments, and I look forward to sharing more from many others from around the world – and closer to home – in the days to come. As I continue to learn and work through the processes of fine-tuning my blog, I appreciate the kindness of everyone who has taken the time to visit my page, follow, share, tweet, comment, or just say ‘hello.’ It is my absolute honor to meet you and I promise to do my best to show how thankful I am by keeping my word to support, showcase, and anything else I can do for my fellow indie authors. Thank you all again so much for being who you are and I wish the very best for all of us in this new year and all the days to come. Big hugs and much love – Tracy J.